Click the Background link under the Appearance menu. The Background Image page loads on the Dashboard. To change the background color, type the hexadecimal color code in the Background Color text box. If you don’t know what hex code you want to use, click the Select a Color link, and click a color within the provided color selector. A hexadecimal (or hex) code represents a certain color. Hex codes always start with a hash symbol () and have six letters and/or numbers to represent a particular color; for example, . 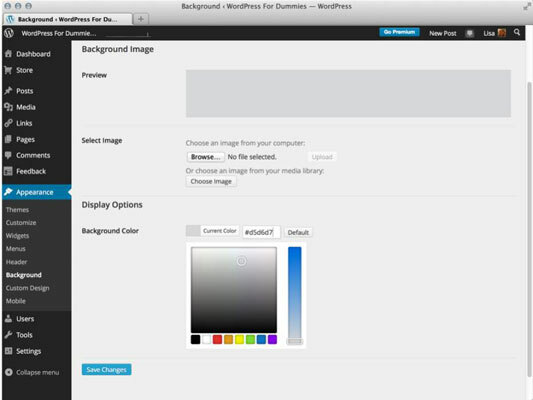 To use an image file for the background, upload an image from your computer. Click the Browse button under the Choose an Image from Your Computer text, and select a file from your computer. Then click the Upload button. Change the display options for your new background image. Position: Select Left, Center, or Right to set the screen position of the background image on your website. Repeat: Select No Repeat, Tile, Tile Horizontally, or Tile Vertically in the drop-down menu to set the image repeat behavior of the background image on your website. Attachment: Select Scroll to set the background image to scroll down the page, or select Fixed to set the background image in a static position (so it doesn’t scroll down the page). Click the Save Changes button before navigating away from the Background Image page. Otherwise, your new settings aren’t saved.